as indicators that the fetus is healthy, and is not experiencing any form of distress during pregnancy or labor. If the mother receives oxytocin, has a difficult labor, or is post-term, it may be appropriate to have a heightened concern that the pregnancy has become high-risk. Early decelerations and slow return baseline. Deceleration persists for 1 minute or more. 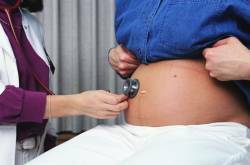 Your doctor, nurse, and other health care providers involved in caring for the mother and child during the pregnancy and delivery, should immediately respond to any sign of fetal distress. In the presence of one or more of the above warning signs, this means commencing proper monitoring of the fetus and when appropriate, beginning treatment of the mother and fetus to eliminate the complication that is causing fetal distress. If the treatment fails, or one or more of the signs that indicate the need for cesarean become present, labor must be immediately induced through cesarean to prevent injury to mother and child. The failure to take these steps may amount to substandard medical care and constitute negligence.